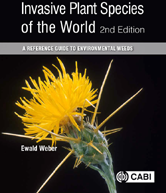 Providing the latest information on the most important invasive plants, this new edition covers the status of many important invasive plants around the world and how international trade may pose serious threats to species and ecosystems. Agapanthus praecox subsp. orientalis F.M. Leight. Akebia quinata (Thunb. ex Houtt.) Decne. Centaurea stoebe subsp. micranthos L.
Chasmanthe floribunda (Salisb.) N.E. Br. Conicosia pugioniformis (L.) N.E. Br. Hakea sericea Schrad. & J.C. Wendl. Nassella trichotoma (Nees) Hack. ex Arechav. Parapholis incurva (L.) C.E. Hubb. Passiflora tripartita (Juss.) Poir. var. mollissima (Kunth) Holm-Niels. & P. Jørg. Vulpia myuros (L.) C.C. Gmel.